Track Titles and Samples may be found below. This is a digital product and will be available for immediate download after your successful PayPal payment (PayPal account not required). You will then have access to the download in your account under downloads. This will allow you to download the zip file containing all the tracks. 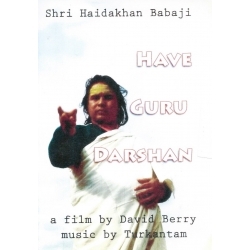 Haidakhan Bhajans is a collection of devotional songs, sung at Haidakhan Vishwa Mahadham, Sri Babaji's main ashram and place of reappearance in 1970. The collection consists of Kirtans and Bhajans. Kirtans are devotional songs containing the name, or aspect of the deity worshipped: Lord Shiva, the Divine Mother Amba, Hari-Lord Vishnu, Hanuman, etc. These are to be repeated as many times as one wants to. Bhajans are religious hymns, telling a brief story. The Lord is given praise in all His glory, in His many forms and manifestations. The underlying theme is one of joy, gratitude and love. The supreme Guru, honored here, is Bhagwan Haidakhan as Shiva, manifest creator and destroyer of the universe, who is also invoked by 108 names, given at the end of this collection. The repetition of these names, or mantras, has been described by Shri Babaji as tarak mantra -- supreme mantra, to be recited daily. 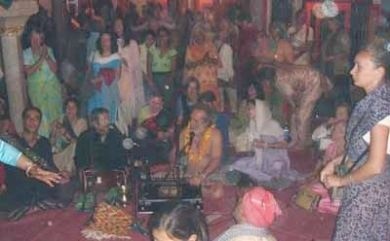 Shri Babaji has commented on kirtan singing, saying: "Kirtan should come to you naturally, through your soul... You should sing devotional music in a way, that stirs the heart, in harmony and with a slow rhythm. Whenever you make music, singing or playing, it should leave a memory on the mind." The mantra OM NAMAH SHIVAYA is the main mantra used in the chanting, and Shri Babaji has enjoined his devotees to : "Always repeat God's name. Whatever you do, wherever you are, repeat the name of the Lord ... OM NAMAH SHIVAYA is the original mantra. It is like nectar, feed everyone with this nectar ... When Mahashakti, the Primordial energy, first manifested, the words she uttered was the mantra OM NAMAH SHIVAYA." Repeating, or chanting this mantra will lead to total union with God. This is Babaji's promise. JAI MAHA MAYA KI JAI!!! Fifteen individual tracks in high quality MP3 format downloadable in one zip file. Please note that the tracks you download are of much higher quality than the samples. "Dear Marge, thank you for providing the Babaji audio mp3s. i lovvvvvvvvvvvvve them!! I will be listening to them for many moons, I am so grateful to have Bhole Babaji's voice and His light!!!! I also want to thank you for providing Babaji.net where everyone can have access to this beautiful and dynamic teaching ... I am grateful to have a place on the web to go to for inspiration and community." It was so lovely of you to include the extra gifts in my parcel. I absolutely love them all and feel so very blessed. I have to share a little Babaji moment with you too. Once I had made the purchase, I did a quiet meditation and I felt the very gentle voice of Babaji say "I have some extra gifts for you." That's all he said … so WOW!!! 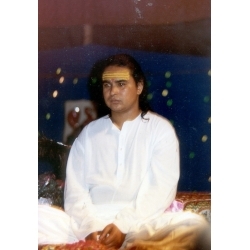 You can imagine my delight … the extra Babaji photos feel like a beautiful blessing and very timely as well. The lapis lazuli mala is so beautiful too. "Thank you for this amazing gift of making Babaji accessible. I have His photos by my bedside & it feels right & natural to bow every time I pass. To have met Him must have been incredible. I know if He came back I would have to drop everything to be near Him. I look forward to reading your stories. Blessings to you & tears of joy for Him." "I just did Om Namaha Shivaya tonight and it answered questions and solved problems I have had all my life. I have been doing this chant for a couple weeks not knowing what was going on with it ... tonight, I felt totally connected. I just want Babaji to KNOW." "Wow - I have only had the time to review briefly but this looks amazing! Great job and meditation, Marge! Peace and love." 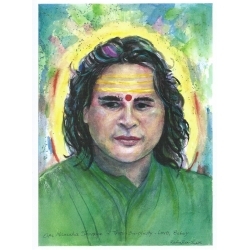 "I've been using the Healing Cards painted by Babaji for 8 months now. Each one of them represent different stages of soul development. For me, the peculiar thing about these cards is that only the card representing my present stage is 'vivid.' All the other cards feel 'empty.' I used to have the card standing on my table, so I can watch it when I'm eating, and sometimes I place a glass of water on it, and drink it. When a stage is over and the card feels 'empty' again, I choose a new one. When I go through the cards there is always one card that all of a sudden feels vivid and beautiful. I cannot understand the cards with my intellect, but find peace in simply gazing at them and absorbing the energies. 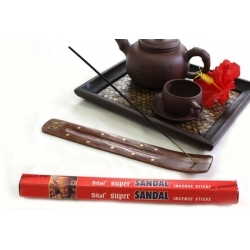 Once when I was very upset, I experinced instant relief when placing it on my forehead." "I would just like to send my heartfelt thanks for the wonderful service you provide. I have ordered many things from you and all have arrived quickly and in good order. 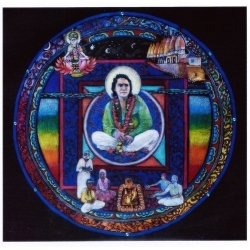 I have just placed another order and am confident I shall soon be receiving more wonderful Babaji goods. 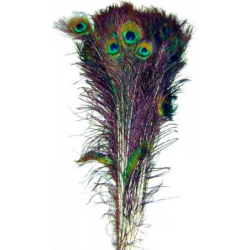 I have ordered books, photos, incense. Three particular items I have been thrilled with are the Om prayer shawl which I wrap myself in during full moon meditation; the Om brass symbol; and the Om Namah Shivaya pendant which I wear most days. I have no hesitation in recommending Marge and her site, I am blessed to have them in my life." 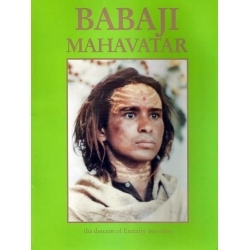 "I ordered the Om Namah Shivaya pendant for myself shortly after "awakening" to Babaji's Presence in my life. I love it. I wear it almost every day. I am particularly drawn to wearing it on those days where I feel myself more vulnerable to negative energies. It serves as a tangible reminder of Babaji, and His teachings of repeating the mantra Om Namah Shivaya, and living in Truth, Simplicity, Love, since these are engraved on either side of the pendant. Wearing the pendant almost feels like having these teachings tattooed onto my body. The pendant has a weight to it, a substance. I also like how smooth it feels when I rub my fingers over it. I ordered the pendant on the leather strap, rather than the silver chain. I slip it off over my head. It was a little harder to do at first, but now it slides off easily. I don't wear the necklace when I bathe, since I want the leather to last. For me, it is like wearing a little piece of Babaji." 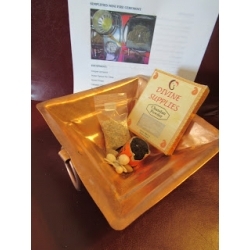 "I have been blessed to have Marge in my life also and it began with my order from her website of the Om Namah Shivaya pendant which I wear every day and has definately become part of my persona - I have also ordered pictures and Marge has sent samples of the wonderful incense that she sells, which I love. Marge has been a beacon of bright light! I feel very blessed to have been introduced to her and her work! Thank you, Marge!" I am quite late, it is over one month ago I thankfully received my order and the many beautiful gifts you have enclosed. It was such a joy to open and discover... I felt like a child on Christmas and all I can say is a heartfelt THANK YOU. I wish you all the best for this New Year. OM NAMAH SHIVAYA"
"These 8 compilations of "Babaji Speaks at Haidakhan" from Vishwagifts are simply providential! I'm infinitely grateful to my brothers and sisters, devotees of Babaji who are making these recordings available to us. Listening to the words of Babaji from his own mouth makes me resonate with the vibrations of a tremendous cosmic energy. In "Babaji Speaks in Haidakhan," his words are so powerful that Babaji makes them reverberate first, in the enlightened consciousness of his high Priest, Shastriji who repeats them, making them flow in an endless stream of supreme wisdom and grace." 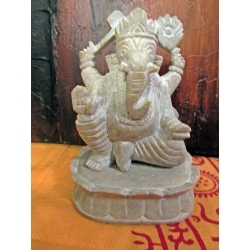 Sign up for the Vishwa Gifts Newsletter & receive special offers and coupon codes available only to subscribers. © 1998 - 2014 Universal Peace Center. All Rights Reserved.